It may be late in the day, but dagnabbit, it’s still Wednesday! Usually I write these things the night before, but last night I was exhausted and in a bit of a funk and not feeling up to writing. But also, I knew this particular Wednesday would be a big one for Wonder Woman. 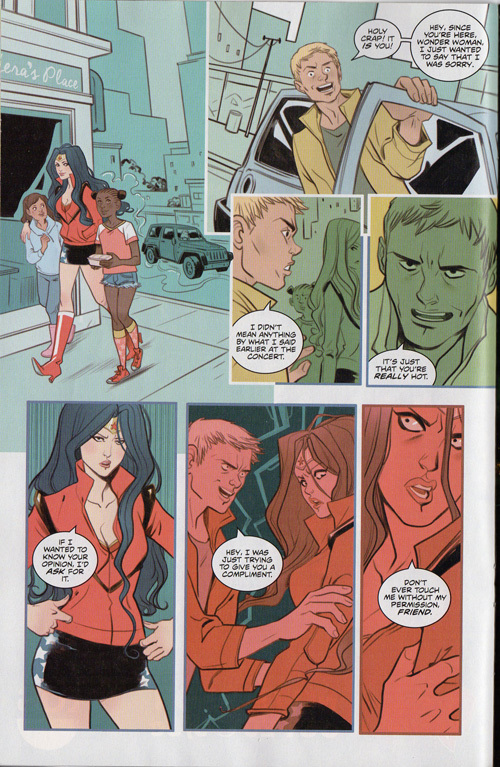 Maybe the biggest news is that Brian Azzarello and Cliff Chiang’s run on Wonder Woman ends today with issue 35, clearing the way for the much-dreaded new team of David and Meredith Fitch, but I read the current Wonder Woman series in trade collections, so I can’t talk intelligently about the last issue without reading the run-up to it. 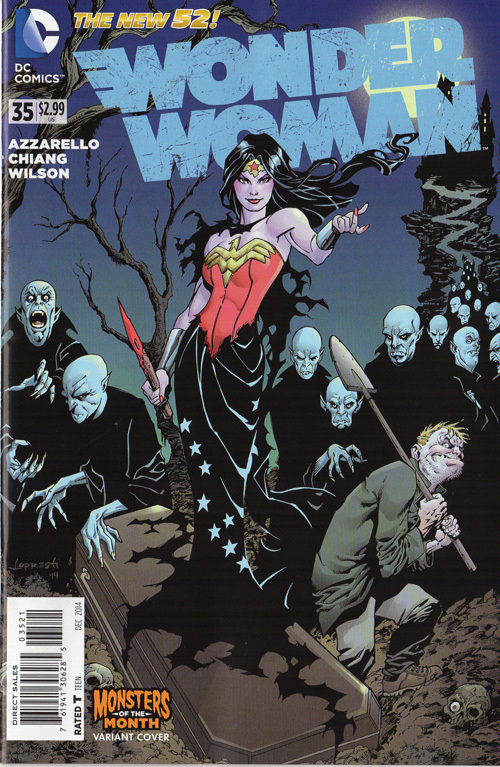 I will say, though, that all of DC’s series this month have Halloween-themed “monster” variants available, and Aaron Lopestri’s vampire variant for Wonder Woman #35 is pretty great. But the big news for me is that Sensation Comics Featuring Wonder Woman also came out today, and I’ve been really enjoying that series. As I’ve mentioned before, this is a freewheeling anthology title for various comic writers and artists to tell whatever Wonder Woman stories they want without worrying about current continuity. And issue 3 is one I’ve been waiting for, featuring a story by Gilbert Hernandez of Love and Rockets fame. Everything inside is super fun and cute, so of course the cover has to be all grim & gritty. 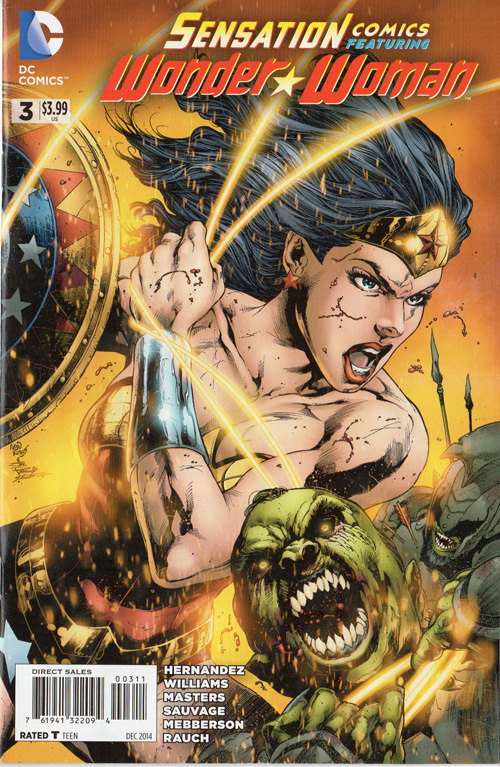 Sensation Comics Featuring Wonder Woman #3, DC Comics, December 2014. There are actually three stories in this issue, or rather two and a half, and they’re all just delightful. 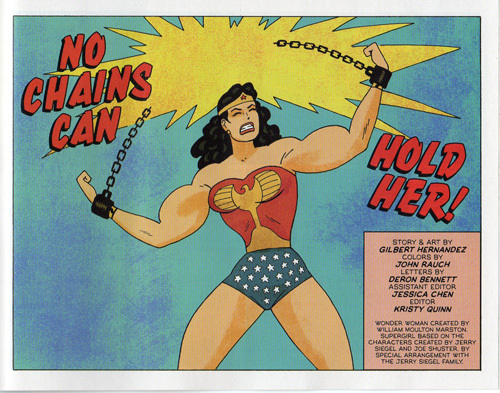 The first one, “Bullets and Bracelets” by writer Sean E. Williams and artist Marguerite Sauvage, shows a very different interpretation of Wonder Woman than we’re used to. This Wondy is the lead guitarist in a rock band called, well, Bullets and Bracelets, but she seems to have her usual superhero powers as well. But really, more than anything the story is a much-needed response to the street harassment that women encounter every day. 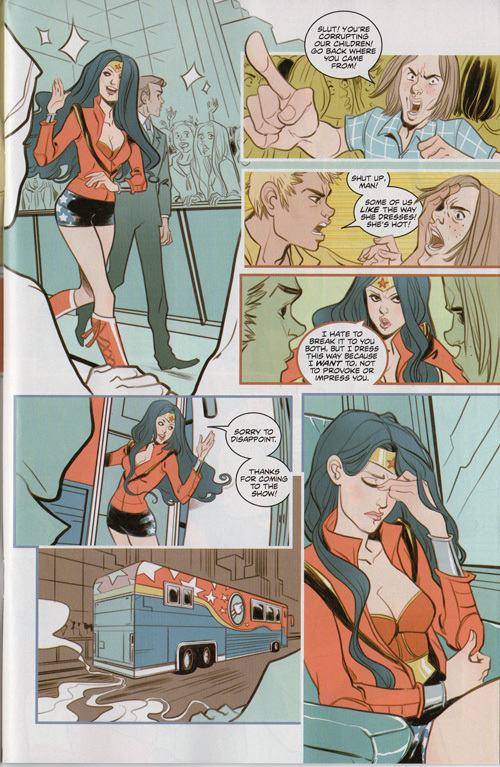 See, even Wonder Woman has to deal with this crap. After a gig, Diana’s harassed in the street by someone hassling her about the way she dresses and someone else who’s way too enthusiastic about it. She also runs into a couple of tween girl fans of hers whom she takes out to lunch, and it’s all pretty adorable. But when the guy who was talking about how hot she was comes back again, well, that’s not so cute and sadly all too familiar. Suffice it to say it gets ugly mighty quick. But Wonder Woman, well, she takes care of it. Yeah, this isn’t going well. “Morning Coffee” by Ollie Masters is also super cute, with delightful cartoony art by Amy Mebberson. Catwoman robs a museum and sets off an alarm, which seems… unlike her, and when Wonder Woman shows up Selina’s clearly expecting her. Catwoman and Wonder Woman have met before on several occasions over the years, both as allies and foes, but because Catwoman’s so firmly entrenched in the Batverse it’s not exactly a frequent pairing. Wondy nabs the thief pretty quickly, but whatever Catwoman’s up to, being caught seems to fit perfectly with her plan. The cops need to call in special forces to properly arrest her (which seems far-fetched considering that WW is right there and Selina has no superpowers, but do not question the plot device), so the two of them have coffee to pass the time. See, I told you it was super cute. But uh-oh, Catwoman stole the Golden Fleece! Which summons certain monstrous protectors that she just might need a Greek-mythology-based heroine to fend off! Of course, people who steal the Golden Fleece also have a tendency to do stuff like killing their children just to prove a point, but let’s not get too based in Greek mythology. 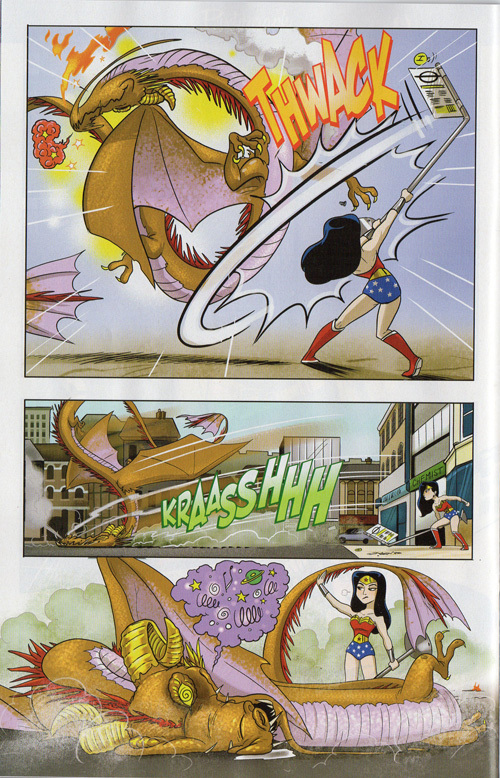 Wonder Woman, of course, has no problem taking care of the beastie, but will Catwoman get away with it? Well, what do you think? As for Hernandez’s story, well, it’s pretty great, but we only get half of it for now, which is frustrating but also a smart move on DC’s part to keep ’em coming back for more. One thing I love about Beto’s WW is how powerful and muscular she is. It’s much more beefcake than cheesecake, although Hera knows he’s never been above the latter. First thing Beto does is debunk the whole thing about her losing her powers when shackled by a man, which of course was all too true in the old days. 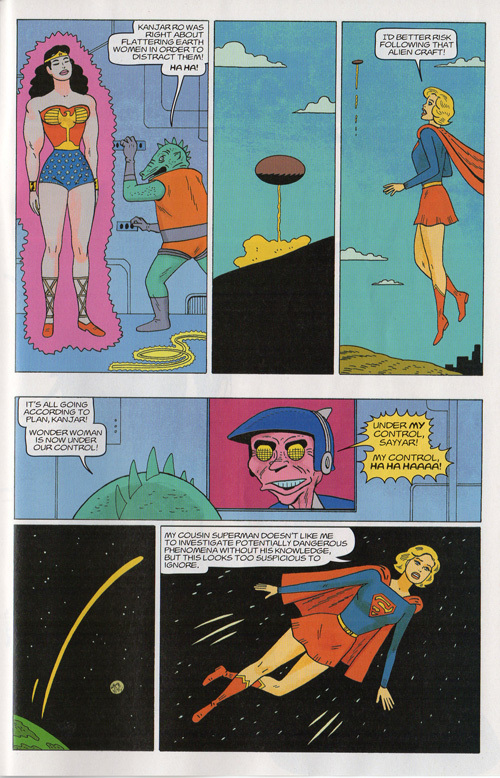 But the story’s about some kind of fiendish plot of the old Justice League villain Kanjar Ro and another space alien, Sayyar, a lesser known lizard-looking guy who actually dates back to Kanjar Ro’s first appearance in 1961’s Justice League of America #3.